This year's conference was full of life! Here are some of the "chai" lights of our time together... and enjoy the image collage to re-live each great moment! 1. Dr. Rabbi Michael Shire gives an inspirational keynote session about the intersections of spirituality and Jewish education. 2. Participants enjoy an interactive workshop about how to make the most of the ISJL curriculum and how they can adapt it to fit the needs of their individual communities. 3. Dori Kirshner’s track, entitled “Special Education is Just Good Education,” teaches participants creative methods to find out what type of learner each child is and how to meet students where they are in the classroom. 4. 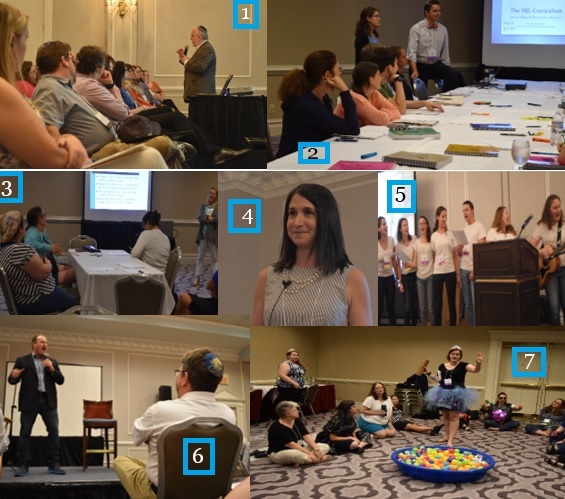 ISJL Director of Education, Rachel Stern, runs an engaging session about the phenomenon of step trackers and how we can bring the ideas of positive reinforcement, validation, and accountability to Jewish education. 5. The Fellows belt out “Born to Drive,” a spin on the Bruce Springsteen classic. Participants love the shtick and can’t wait to bring their own song parodies back to their communities. 6. Comedian Dave Goldstein has everyone in a fit of laughter as he cracks jokes about the energetic Fellows and his past experiences performing for Southern Jewish communities. 7. ISJL Ed Fellow, Ali Duhan, leads an experimental min’yan, “Toddlers & T’filah.” Conference goers participate in creative activities (like finding parts of the amidah in a ball pit!) that they can bring back for an enhanced Tot Shabbat in their communities. Stay tuned for more pictures, recaps, and links to resources provided during the conference!